Every medical issue has a list of signs and symptoms attached to it. These make it easier to diagnosis and treat the problem, however, unexpected complications may arise. Despite the fact that sores and blisters are not commonly linked to yeast infections, they can be caused by the condition. A yeast infection is a fungal condition that causes irritation and inflammation. The most common type is vaginal, which may also be referred to as candidal vaginitis. Though candida is a type of yeast that grows naturally in the body, it is possible for an excess to occur. That leads to an infection and can cause many unwanted symptoms. The causes of excessive growth can vary, but have been linked to the use of antibiotics, stress, lack of sleep, poor dietary habits, pregnancy, and diabetes. For men with a yeast infection, issues tend to be small white spots, redness, or a rash on the genitalia, along with itching, irritation, and burning. In addition to those well-known symptoms, there may also be unexpected ones, including blisters and sores. The University of Maryland Medical Center sites blisters as one of the possible symptoms of a yeast infection, and, according to the Mayo Clinic, sores can be a sign of a complicated yeast infection and may be the result of severe itching, swelling, and cracks from the initial infection. If the infection is incorrectly treated or left untreated, blisters and sores may be also present. A StudyHealth article stated that men with yeast infections are more likely to experience blisters than females; however, both genders can be affected. When sores or blisters are present, their location is important. Those caused by a yeast infection appear in areas like the feet, inner thighs, buttocks, armpits, groin, genital area, and anywhere there is moisture. As a result, they may be painful or cause discomfort. Both tend to develop after a rash, so it is important to pay attention and take proactive measures. 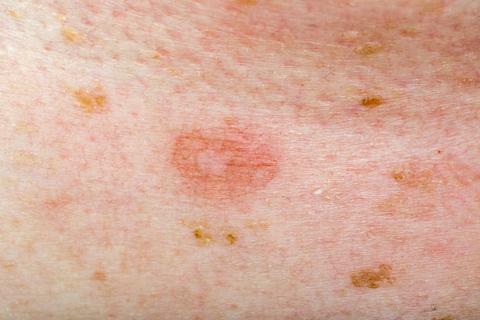 If sores or blisters do appear, it may be difficult to differentiate them from other types. The reason for this is that they may look like any other blister or sore you may experience (such as red or raised sores or water filled blisters). It can be difficult to determine whether they are related to a yeast infection or not. Instead of focusing on the actual appearance, consider the other symptoms that are present. Some studies on yeast infections mention sores. It's important to note that typically these types of sores result from scratching the irritated area and are not a direct result of the initial yeast infection itself. One study, published in Obstetrics & Gynecology, found that 17 percent of women with an overgrowth of candida had vulvar fissures (long cuts or cracks in the skin) and four percent had excoriations (raw irritated tears or abrasians caused by scratching). If symptoms of a yeast infection are present, treatment is necessary. You can address the yeast infection by looking into over-the-counter products (along with natural remedies) designed to treat the issue. According to HealthLine, yeast infections should clear up within three days to two weeks, depending on the severity. In addition to treating the infection itself, it is important to heal sores and blisters. Apply a topical skin cream as needed to ease itching or discomfort. If possible, apply a bandage over top of the affected areas to prevent unnecessary friction. This will decrease the chance of a blister popping or sores becoming more painful. The Mayo Clinic points out that complicated or recurrent yeast infections may need treatment such as long-course therapy, multidose oral medication, and a medication-based maintenance plan. In most cases, it's best to consult with a doctor before taking matters into your own hands. This is especially true if it is your first time dealing with a yeast infection or anytime blisters and sores are present. Since blisters and sores are not the most common symptoms of yeast infections, it is important to understand the cause. Their appearance may indicate a more advanced infection or another medical issue altogether. They may result from more serious medical issue rather than a yeast infection, including sexually transmitted infections and autoimmune diseases. Yeast infection symptoms, according to the National Library of Medicine, are in fact similar to many other types of genital infections for both men and women. WebMD estimates that 50 percent of women who think they have a yeast infection actually have a different type of vaginitis. Additionally, Cedars-Sinai Hospital states that genital sores or ulcers are typical of the Herpes Simplex Virus, so it's important to get an appropriate diagnosis and treatment plan for the specific issue causing the sores or blisters. Visiting a professional can help determine the cause as quickly as possible so you can start an effective treatment method. Painful and uncomfortable symptoms related to a yeast infection can be frustrating to deal with, and sores and blisters could potentially be the result of another issue. With the correct diagnosis and medication, however, they can be effectively treated.